On Nov. 22, 1963, medical students in George Washington University’s (GW) Class of 1966 were taking a microbiology exam when the proctor came in and wrote one sentence on the blackboard — “President Kennedy is dead.” That memory remains one of the most poignant for Arthur Abt, M.D. ’66, who recounted the tale during the GW School of Medicine and Health Sciences (SMHS) Class of 1966 H Street Society celebration. 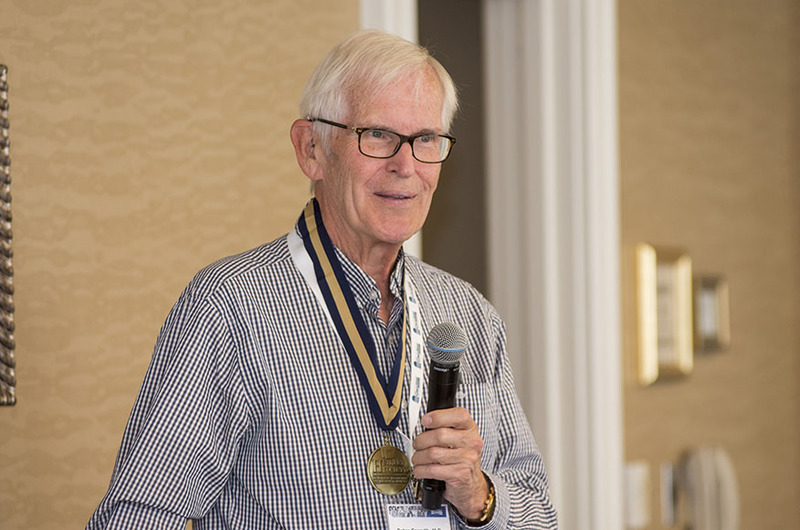 Induction into the society, named to commemorate the location of the former GW medical school, is held during alumni weekend and allows members of the class celebrating their 50th reunion to share memories of their time at GW. While some alumni who spoke at the event at the Fairmont Hotel have hung up their white coats to spend time with family and on life-long hobbies, others remain active in caring for patients and pursuing their passion for medicine. “[GW] has changed a lot through the years, but … the clinical teaching is still at the core of who we are, and what we do, and very much the identity of the physicians who graduate from here,” Jeffrey S. Akman, M.D. ’81, RESD ’85, vice president for health affairs, Walter A. Bloedorn Professor of Administrative Medicine, and dean of SMHS, said in his opening remarks at the event. “I look forward to being at this lunch in 15 years in a different capacity … not as dean,” he joked. As a microphone was passed around the room, the old friends and classmates spoke of how grateful they were to be together again, to share stories, laughs, and even some tears, and speak to all that their education at GW still means to them. “I tried retirement; that lasted two days,” Cantril Nielsen, M.D. ’66, quipped during his remarks. He added that with the urging of his wife, he started his own practice instead of ending his medical career. Today he only works part time, so down to 40 hours instead of 80, he joked. Peter Carruth, M.D. ’66, who practiced as a general surgeon for 35 years, continues to assist in cardiac surgery, “which is kind of nice because it gets me out of the house,” he said. Carruth’s main memories of his time at GW revolve around his work as a third-year student at D.C. Village, a nursing home for the aging indigent, and Junior Village, a D.C. orphanage. Ten students lived out by the facility, where they got free room and board for assisting as night call helpers and clinic supporters, he said. “It’s an opportunity that nobody could do anymore as a third-year medical student,” he added. In addition to the Class of ’66 inductees, graduates from classes that came before were in attendance at the event; among them was Kathryn Williams, M.D. ’56, one of four women in her class of 96 students. She noted that GW was “very gracious” to her and the other three women, as were the members of the class itself. After graduation, Williams went on to practice medicine all over the United States, moving across the country with her husband, who was serving in the Navy. She credited her time at GW for giving her the opportunity to broaden her horizons. Today, the incoming class of medical students is more diverse than ever, Akman noted at the close of the event. In fact, 60 percent of the class is female and 40 percent is male, he said.